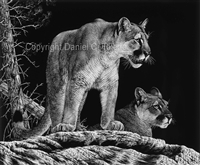 SCRATCHBOARD PRINT "MOM AND THE KIDS"
SCRATCHBOARD PRINT "MATES OF THE WILD"
Details: Each print is signed and numbered and comes with a certificate of authenticity. Shipping is additional and dependent on the type of service and destination. SCRATCHBOARD PRINT "EL TIGRE OF THE MATO GROSSO"
SCRATCHBOARD PRINT "A GENTLE APPROACH"
SCRATCHBOARD PRINT "MASTER OF THE JUNGLE"
SCRATCHBOARD PRINT "CONQUEROR OF THE NORTH"
SCRATCHBOARD PRINT "LAST OF HIS KIND"
SCRATCHBOARD PRINT "I AM TIGER"
Details: Daniel was commissioned to do this painting of a neighbor's Abyssinian cat. 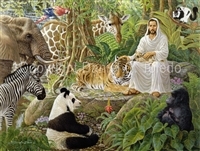 Details: Jesus and the Endangered Ones is available in 30" x 40" giclee canvas prints - the same size as the original painting. Each print is signed and numbered and comes with a certificate of authenticity and this is an open edition. Shipping is additional and dependent on the type of service and destination. Details: This is a limited edition giclee print on canvas. It is the same size as the original that was painted. Each print is signed and numbered and comes with a certificate of authenticity. Shipping is additional and dependent on type of service and destination. Dimensions of print: 24" x 30"
Details: A visit to Running Springs and Big Bear, CA inspired Daniel Toledo to paint this original painting. "While hiking I discovered an old dead tree that I felt would be a perch for a golden eagle. 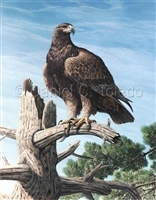 Later that day, I visited Moonridge Zoo and discovered my golden eagle models for the painting. Sometimes things just fall right in to your lap!" 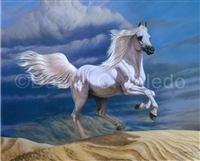 "Golden Lady of the Sky" is a limited edition giclee print on canvas and mounted on stretcher bars. Shipped flat. A certificate of authenticity accompanies the print. Details: "Beautiful Intruder" takes place in the jungles of South America where the jaguar reigns. The painting captures the special moment of a young jaguar cub's first encounter with the beautiful intruder, the monarch butterfly. Originally painted in acrylics on masonite, this limited edition giclee print is available on canvas and mounted on stretcher bars. Shipped flat. Details: I originally was commissioned to paint "Taking it to Heart" on a 5' x 6' canvas in acrylics for a dear customer. 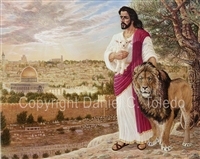 The story on this piece is unique because she originally wanted a painting with white animals and thought she wanted white tigers. I suggested the trumpeter swans and she fell in love with the idea and so "Taking it to Heart" was born. 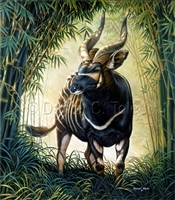 This limited edition giclee print is available on canvas and mounted on stretcher bars. Shipped flat. A certificate of authenticity accompanies the print.